Boycotting Delimondo is the Answer to Historical Revisionism? September 27, 2018 - by Hector Gamboa - 31 Comments. 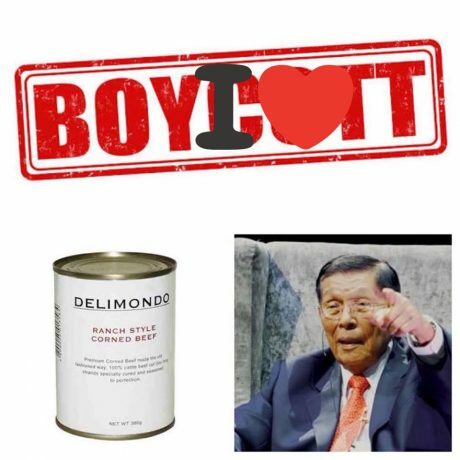 Yellows and commies have been bombarding social media in the Philippines lately with calls for a boycott on the popular corned beef Delimondo. This call for a boycott on the product arose in the aftermath of the Bongbong Marcos – Juan Ponce Enrile (JPE) tête-à-tête discussing what happened during the Martial Law period in the 1970s, including the reasons why former president Ferdinand E. Marcos made the declaration. Enrile, of course, spoke about his own personal accounts of what transpired as he was in the middle of the action back then and was even credited as the “architect” of the 1972 martial law. Enrile openly challenged anyone for a public debate on the matter but instead of a civilized discussion and debate a lot of yellows, who bewailed what they deemed as Enrile’s attempt at historical revisionism, responded with their vitriolic rants like a pack of hyenas with hemorrhoids and called for a boycott on Enrile’s daughter’s corned beef product. As usual, we see the “brilliance” of the jaundiced and commie pack who become perpetually offended with anything that threatens their dogma. It is as if a 95 year old multi-millionaire, who probably only has 1 fly refusing to sign his croaking papers going for him, would really care and get affected. In 2000, during then-president Joseph “Erap” Estrada’s time, critics of Erap called for a boycott on banks owned by figures known to be associated with Erap such as PCI-Equitable Bank’s George Go, Philippine National Bank’s and Allied Bank’s Lucio Tan, and the United Coconut Planters Bank’s Eduardo “Danding” Cojuanco. The aim of the boycott was to punish the mentioned individuals in supporting Erap. Did these individuals go to the poor house because of the boycott? No. In fact, the boycott hardly (if any) put a dent on the 3 tycoons’ bottom-line. So really, in a lot of cases, boycotts are really nothing more than about bringing attention to a person or a group calling for the boycott. Most boycotts really have a selfish motive behind them. In GMA’s time, it was about trying to pressure a bank (and other banks) into giving the Philippines a favorable assessment. In Erap’s time, it was about anti-Erap partisans trying to pressure tycoons sympathetic to Erap to withdraw their support on the president at that time. So it is really about an attempt to display power so that they can be viewed as a force to be feared and to kowtow to. Even if, for the sake of argument, that a boycott does become successful in putting financial damage on a business to punish someone or a corporation whose beliefs or practices we do not agree with, who do we think will likely suffer the most in the boycott? It would be the employees of the businesses who will suffer the most! For instance, Katrina Ponce Enrile’s (JPE’s daughter who owns Delimondo) employees are just trying to earn an honest living and in some cases, are just lucky to have a job at all. A drop in sales could also mean the necessity to layoff employees to compensate for the loss in profit. Even if, by the power of some yellow god, JPE quits talking about his “sacrilege” on the yellow martial law dogma, does this mean that what JPE revealed is now factually wrong and the truth about the yellow narrative on martial law holds? No! This is settled through a thorough discussion and study of various available historical evidence and facts. A group of insecure people who feel that their long held belief is threatened, imposing their will on another person, is nothing but a form of childish punishment and perception of correcting a perceived wrong. You see, all the noise about calling to boycott Delimondo is really just an idiotic attempt to defend a partisan position that really does nothing in the assessment of historical facts and evidence. History, much like scientific beliefs and positions, is open for change with the advent of new data. We do not need to be afraid of historical revisionism because it actually happens a lot. What we need to be afraid of is historical stagnation which means that we are looking at it not under an objective lens but as dogma. What difference would these so-called “anti-revisionists” have with a bunch of Damasos who placed Galileo Galilei in prison for his “heresy” by promoting heliocentrism over the Catholic Church’s strongly held belief of geocentrism? Sure, Galileo eventually caved in and was forced to recant but did that really establish the truth of the Church’s belief that the universe revolved around the Earth, as interpreted through the Holy Scriptures at the time? Let’s not even go to Europe to demonstrate the folly of looking at things through a dogmatic lens. Even our very own pre-colonial history has changed what many people long believed. For instance, given new facts and evidence, we are no longer expected to just accept that Lapu-Lapu himself killed Magellan during the Battle of Mactan. Defending a position does not need emo-feel-good boycotts and washed-up Twitter hashtags like #NeverAgain. What is needed is a careful and objective comparative analysis of evidence and facts. What we need to do is to assess historical claims like how things are approached in science. Rather than riling up a mob to ensure that the yellow narrative holds the yellows need to up their game by confronting their perceived adversaries with sound arguments supported by objective facts. The old washed-up anti-Marcosian playbook that is riddled with poisoning the well and appeal-to-pity arguments under either a yellow or red lens won’t work anymore in the Duterte era where people have become sick of the brand of the petty-jaundiced-commie-politics-loving morons who are so out of touch with the people on the ground today. So to those who were enraged by Enrile’s words, if you do not agree with Enrile’s accounts and your solution to right the wrong that you think Enrile has said is through a boycott of this juicy, chunky, delicious and amazing corned beef, then congratulations! You’re an idiot! Next Article Should Philippine President Rodrigo Duterte resign? When Filipinos open their mouth cover your ears pinch your nose and shove that carrots in their mouth … BECAUSE WHAT YOU HEAR … WHAT YOU SMELL …. WHAT THEY TALK ABOUT IS SELF-SERVING and mostly lies …. When I read history textbooks about Philippines IT DOESN’T MAKE SENSE AT ALL. These textbooks are meant to misinform misguide and lower IQ of Filipinos already low I.Q. Even their news are blatantly idiotic for stupid consumption only. Their OP-ED s are addicted to SCIENCE … yes, Virginia, Filipinos love SCIENCE because they have SCIENTIFIC MINDS … it is called POLITICAL SCIENCE …. USELESS PUNKS ! Every Pilipino graduates of any “prestigious” school in the country are all well versed in “science” and every Pilipino who were deprived of education( just only 90% of them) must listen, believe and obey to every word of the “educated” because they are the authority, whatever comes out of their mouth is the “truth” because it is science, and it will be “science”. What is important is authority over the mind of the people, and when the authority say it is science then it is science. AGREE TO THIS COMMENTS= BECAUSE WHAT YOU HEAR … WHAT YOU SMELL …. WHAT THEY TALK ABOUT IS SELF-SERVING and mostly lies …. … AND COMMENTS FROM RAPPLER ????? NO COMMENTS FROM RAPPLER BECAUSE THEY, TOO, ARE BUSY ANALYZING POLITICS …. and of course, they are not going to criticize the school they came from …. ALL FAKES ….. TOTALLY ABSOLUTELY …. NO DOUBT ABOUT IT …. I guess by now we should already have a conclusion why it is necessary to make the majority of the population ignorant/illiterate. It is the elite wants it to be, and for the Pilipino elites, it is all about ego and arrogance. There are MESTIZO Elite and FILIPINO Elite … The MESTIZO Elite wanted the Filipinos to progress thru colonial mentality … but the FILIPINO Elite, those that did not make it to Forbes Philippine Richest, wanted the Filipinos where they are ….. Yes, Sari-Sari store mentality …..
COLONIAL MENTALITY is good. If the last remaining colonist has COLONIAL MENTALITY and they progressed never a taint of corruption and thievery, therefore, IT IS PROOF COLONIAL MENTALITY IS GOOD. FILIPINO MENTALITY … BaaaaaD !!!! If you don’t agree with them….Boycott them ! I have never seen a more stupid and childish way to get back to those who do not agree with you. The 1986 EDSA narrative, Aquino Cojuangco- NPA/CPP-YellowTards-Roman Catholic Church version of ” EDSA revolution, was in truth a U.S. Dept. of State/ U.S. -C.I.A. coup d’ etat, that removed the late Pres. Marcos Sr., and replaced him with Cory Aquino, who lost the 1986 Presidential election. It is “historical revisionism’ for those who swallowed the U.S./C.I.A. disinformation. But, to right thinking Filipinos: it is just trying to put the Facts in the right place. It should be a patriotic duty for Filipinos who are thinking right, to straighten the thinking of most Filipinos, who are still suffering from this “YellowTard disease ” of historical disinformation. Many of the Filipinos are naive and gullible. The Aquino Cojuangco political axis and their minions, have taken advantage of these Filipinos, for more than 30 years already ! SO, SAY AGAIN? Who they were revolted against? After the ice cream and iced water and iced candy melted along EDSA who ruled the Philippines? The remnants of crook supporters …. and the losers? Not only Marcos also those people who “REVOLTED” in Fake Revolution. Even the Monument at EDSA does not show the real heroes, the first responders: The prostitutes, balut vendors, iced water vendors, ice candy vendors, cigarette vendors, unemployed, unemployeables …. THE BUSINESSMEN AND THE CLERGY CAME OUT AND GRABBED THE LIMELIGHT AFTER ALL THE VENDORS BECAME NUMEROUS TO BE RA-TA-TATed by Marcos. The EDSA revolution was a U.S./C.I.A. sponsored coup d’ etat. They wanted to remove Pres. Marcos Sr. , and replace him with their puppet: Cory Aquino. Marcos Sr. refused to renew the 99 lease of U.S. Bases Agreement. It was like Panama. Gen. Noriega, refused to renew the lease of Panama Canal. Panama was invaded by the U.S. Gen. Noriega was arrested. And the U.S. , put a puppet President in Panama. Panama Canal lease the U.S., was renewed, after the invasion, and after Gen. Noriega was arrested and jailed in the U.S. ! The inquirer Magellan article sounds white bias dude. According to a historian’s one sided account of event, are you serious? Lapu Lapu became a hero by being George Washington of what was Philippines before it was called Philippines. Winning a battle against the would become colonizers of our country was surely appreciated by the natives. Filipinos is suffering from in the beginning and forever suffer will be. BECAUSE LAPU-LAPU KILLED MAGELLAN !!! To this day CHRISTIAN Filipinos celebrate the killing of the Magellan who spread the word of God. THAT IS WHY FILIPINOS ARE CURSED PEOPLE OF ASIA …..
Magellan came to the Philippines, to discover new lands for Spain. The “Spread of Christianity”, was just a pretext for colonization. It was the same tactic the Spanish invaders used in South America. “Spreading Christianity”, the reason of their presence. After the invasion, the Spaniard looted the golds of the : incas, mayas, aztecs, etc… These looted golds were shipped to Spain. Ferdinand Marcos Sr was a master thief. Imelda Marcos was a sous-thief. Their conjugal crookery sired non-accepting historical revisionist serial deny-ers that they became today because of mass thievery. How these family maintain their lifestyle is beyond Filipinos imagination. Where they get the money from? To this day PCGG Philippine Crookery of Good Governance still not checking their bank accounts where these money came from. If they can check the bank account of Renato Corona why can’t they check the bank accounts of the Marcoses? Turning a blind eye (I hate that phrase it is often used by Filipinos) ? Or, because the investigators are low-IQ brown skin Filipinos not American whites. The PCGG investigators and Rapplers rely on gossips and typewritten notarized affidavits as evidences instead of forensic science and forensic accounting. They submitted these affidavits to Americans and Swiss banks but not accepting it because these 1stWorld countries prefer forensics that are incontrovertible and foolish-proof and Filipino-proof. Most of all Rappler is hard-wired for political analysis not true-blue forensic investigations. When Enron went bankrupt … FBI & SEC went to Enron HQ and CEO offices …. THEY CAME OUT with boxes and boxes of evidence … THIS NEVER HAPPENED IN THE PHILIPPINES …. Instead the typewriters are smoking cranking out affidavits and affidavits and piles and reams of affidavits …..
FILIPINOS ARE SOOOOOO LOW-IQ AND THEY SAID U.P. ATENEO AND LA SALLE CRANK OUT THE BEST LAWYERS … AHA! HA! HA! HA! FOOL THE FILIPINOS …. NOT ME ….. The Aquinos and the Cojuangcos were thieves, collaborators and treasonous. Enrile trying to revise history to wash his hands of crime when he is old is VILE. This is the equivalent of holocaust deniers or sandy hook conspiracy theorists. Sadly there will always be retarded people who will be supportive. That’s why infowars makes so much money. GRP here’s a business idea , might as well hawk some snake oil as your audience will lap into everything. It’s only proper to stop funding SOBs with your money out of principle. (There has been a lot of activism in the US as well). Sure it usually amounts to nothing, but it’s about standing up to principles. Something most pinoys don’t understand. Enrile in cahoots with U.P. Master of Revisionist History can revise history like how U.P. Historians revised the history of Gen Emilio Aguinaldo when they got caught that Gen Aguinaldo was caught with his hands in Mexican Cookie Jar. American History is now etched in stone …. Philippine History is drawn in sand and washed away storm surge. American history is like the :”Battle of Manila Bay”, in which U.S. Admiral George Dewey, was “victorious in the “naval battle”. The Philippines was already sold, in the Treaty of Paris, France, by Spain to the United States. Before, that “naval battle” happened. Dewey Blvd. was named to the street, fronting the U.S. Embassy, along the Manila Bay, to commemorate that , “naval battle victory’. The street is now named: Roxas Blvd. I ask for any rebuttal of this claim, from any reader ! Philippine Civic textbooks says it is an agricultural country. NO IT IS NOT !!! Philippines IS NOT AN AGRICULTURAL COUNTRY BECAUSE THEY CANNOT FEED THEMSELVES !!! They import rice. If they cannot import rice they SMUGGLE THEM !!! Once smuggled rice is caught. The government let it rot while Filipino children go hungry !!! I LOVE FILIPINOS !!!! THEY ARE BRILLIANT !!!! The YellowTard followers and their rice hoarders , are paid by the Aquinos , to hoard rice, in order to make it appear that there is a rice shortage. Then, that crook: Mar Roxas, come along and give unsolicited advice to Duterte, to solve the rice problem. Mar Roxas is nothing but a hypocrite, and a ” low life politician”, who stole the Typhoon Yolanda Fund, that would had helped the typhoon victims in Leyte. If Mar stole it, why don’t they send him to jail? It is a history written to show the “heroism and sainthood” of Ninoy Aquino, Jr. and Cory Aquino. There are still many living Filipinos, who were there in the 1986 EDSA coup d’ etat. It is not historical revisionism. It is putting the truth in the right place ! Ninoy Aquino, Jr. is the founder of the New People’s Army. He financed the shipment of arms for the NPA, thru the MV Karagatan in Palanan, Isabela. Cory Aquino protected the Hacienda Luisita , during the Aquino era. Her family scammed the land from the Philippine government. 1986 EDSA was not a revolution. It was a coup d’ etat supported by the U.S. State Dept. and the U.S. /C.I.A. , with the help of the : N.P.A./C.P.P. of Communist Supremo, Jose Maria Sison and Cory Aquino; the Feudal Oligarchs; the Roman Catholic Church; and various left wing opposition groups. The Aquino built an EDSA Shrine to perpetuate the myth of their heroism and sainthood. Have their EDSA day as holiday. Put their faces in our currency. And named our international airport and memorial stadium with their names. The mainstream media were always featuring them, as heroes and saints. In truth, the Aquinos were the worst crooks and low life politicians in the history of the Philippines. These facts are not written in the Philippine history books ! agree to your comments=If you don’t agree with them….Boycott them ! I have never seen a more stupid and childish way to get back to those who do not agree with you. Delimondo. I have to put this in our next grocery list. I never thought of it as a “juicy, chunky, delicious and amazing corned beef”, until now. And don’t forget to put your grocery list on Nutribun. If you remember that bread at the time of Marcos era & that is one of his “humble” & “pro-poor” projects that he ever done during the *ahem* Martial Law era in the 1970s. That’s hilarious. I don’t buy that stuff because, if I wanted to eat pet food, I’d buy a tin of pet food. Absolutely incredible Filipinos boycott it on the basis of who makes it, rather than what’s in it. I suppose that sums up Filipino “thinking” on pretty much any subject. reposted not my comments= “the sun will rise tomorrow. the truth shall set us free from the Economic hitmen+=If you don’t agree with them….Boycott them ! I have never seen a more stupid and childish way to get back to those who do not agree with you.